Click the relevant page number to go straight to the links. N.B. Books have been modified for other countries. The first page shown below is the modified version; the second is the original Australia/NZ version. Contains interesting and detailed sections on feelings and emotions, both positive and negative. http://www.cyh.com/HealthTopics/HealthTopicDetailsKids.aspx?p=335&np=287&id=1465 - Friendship. This site is aimed at children and explores the friendships that students make, problems that friendships endure and ways that conflict can be resolved. http://kidshealth.org/teen/your_mind/emotions/someone_died.html - Understanding grief and death. http://www.kidshealth.org.nz/helping-child-cope-death-parent - Helping a child cope with the death of a parent. http://kidshealth.org/teen/diseases_conditions/learning/learning_disabilities.html - A look at learning disabilities from a child's perspective. www.reachout.com.au - Reach Out! This website was set up with the intention of providing a forum for suicidal youths. It contains valuable sections on coping with a range of issues such as eating disorders, bullying, family issues, loss and grief, depression, drugs and alcohol and teenage pregnancy. While designed for secondary students, it can still be a handy resource for students who have older siblings who may be dealing with these issues. www.kidshelp.com.au/ - This site provides support for a 24 hour help line for kids - 1800 55 1800. It contains information on bullying, domestic violence, problems at home or at school. The website contains important information on why children call the help line and provides a list of services and useful authorities for further contact. 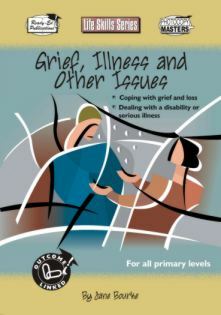 www.allkidsgrieve.org/ - A valuable resource for teachers, parents, counsellors and caring adults. http://www.familyrelationships.gov.au/- An excellent background resource for teachers and parents with sections on coping with divorce, step families, coping with change and so on. Much of the information deals with adult relationships, however, there are some interesting sections that explain how to guide children through difficult aspects of relationships. www.familymanagement.com/ - A useful family resource with articles on a number of areas such as dealing with grief, relatives, disasters and so on. http://www.goodgrief.org.au/nav.htm -- Seasons for Growth. A non-profit, non-religious program based on the principal that grief is normal and can be a valuable part of life. Provides opportunities for students to examine how grief, whether through death, separation or divorce, can impact on their lives. www.opendoors.com.au - OPEN DOORS Counselling and Education Services. www.skylight.org.nz - Skylight Trust. Suitable for teachers, this New Zealand website is from the Skylight organisation. Skylight supports children and young adults facing grief, loss and change in their lives. Contains international links as well as NZ contacts. www.cope.edu.au/ - Centre for Personal Education. Contains information on community relationships, family relationships and community and health service workers. http://www.rainbows.org/ - An international, non- profit organisation that fosters emotional healing among children grieving a loss from a life-altering crisis. www.hospicenet.org/html/talking.html - Includes useful information about how to talk to children about death and loss. www.nalag.org.au - National Association For Grief and Loss (Australia). www.compassionbooks.com/ - Compassion Books, USA. http://siblingsaustralia.org.au/ - This site is dedicated to children who may have a sibling with a chronic illness. http://www.thebigproject.co.uk/links_charities.htm - Contains a list of charity organisations for a whole range of issues. Click Here to report broken links and websites that have moved. Please include the book title and page number in your email. These pages were last updated on November 9, 2015. Send email to info@readyed.com.au with questions or comments about this website.